I've been lucky enough to have been included in Elisa Lorello's book tour for She Has Your Eyes, which means that I was given a complimentary copy in exchange for an honest review. Obviously, all of my reviews are honest, but I thought I'd just confirm that for you, anyway. Haha! Now that that's out of the way, onto the review! 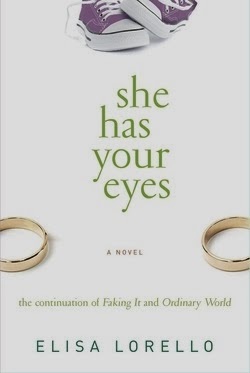 While writing my review of She Has Your Eyes, I realized that if you haven’t read Faking It or Ordinary World, just about anything I say could be spoiler-y. So, in hopes of NOT ruining anything for you, I’m going to tread lightly because…well…you need to start this series from the beginning. So, in order to write a review without…err…writing a review, I'll focus on why you not only need to read She Has Your Eyes, but everything that Elisa Lorello has written. To sum her work up in five words, they would be: undeniable talent for character development. So that's what I'll be talking about in my review. As you can see, the main characters in She Has Your Eyes are still Andi and David (Dev in Faking It) and they are two of the most interesting characters I’ve had the fortune to stumble across. Especially Andi. I rarely love books where I don’t want to hang out with the MCs, but Andi breaks that mold. Heck, she blows that mold to smithereens. You see, Andi doesn’t think the way that I do. Like, at all. And she goes through A LOT in this series. From extraordinary emotional growth in Faking It, to learning how to live after an unimaginable loss in Ordinary World, and then navigating what it means to be a truly supportive partner to David (and other friends/family) in She Has Your Eyes. I think that the contrast between Andi’s vulnerability and her natural inclination to look at the world from an ego-centric point of view are what make her such an interesting character to follow. There were times I was positively angry with her behaviour in She Has Your Eyes, but instead of disengaging from the story, I found myself rooting for her. Not in a “hope she wins,” way, but more of “please tell me she gets out of her own way because she NEEDS TO GET OUT OF HER OWN WAY” kind of a deal. And boy oh boy, is Andi proficient in getting in her own way in She Has Your Eyes. *headdesk* Ha! And that's what I mean when I say that Elisa Lorello has an undeniable talent for character development because it's WAY easier to write an easy-to-love character than one who challenges readers, which is one of the reasons that I'll be a Literary Lorello Lover forever. Because she's that good at character development, guys. For reals. But you can't have a book full of challenging characters or readers would riot (haha), which is where David comes into play. Handsome, caring, ridiculously-patient and saint-like David who is a wonderful counterpart to Andi. Andi seriously puts him through the ringer in She Has Your Eyes but David remains committed, even when I would have packed my bags and purchased a one-way flight to less-drama-ville. But David sees past Andi’s somewhat prickly vibe when she’s put in uncomfortable situations and checks her when she needs it. Plus, he asserts himself more in She Has Your Eyes, which makes him even more attractive and since he’s super hot to begin with, that was a nice little bonus. So thanks for that, Elisa. Haha! I will admit that I didn’t feel the same level of emotional intensity in She Has Your Eyes, but I think that’s because I could barely function wept through the majority of Ordinary World. That’s not to say that She Has Your Eyes isn’t emotionally intense, because it is at times, but for whatever reason, the stakes weren’t quite as high for me. I still absolutely enjoyed it, though! So look, if you haven’t read Faking It and Ordinary World, you’ll probably still like She Has Your Eyes, because everything you NEED to know is summed up in the first few chapters but I’d caution you because you won’t know the entire multi-layered and deliciously complicated history. Especially considering what Andi went through in Ordinary World. So basically, what I’m saying is that you’re going to want to download all of them and then start from the very beginning. Trust me, you won’t regret it. But, uh, have some tissues handy, okay? Haha! And because Elisa is extra awesome, not only did she write a fantastic guest post on Wednesday about the importance of music in She Has Your Eyes, but she’s also generously offered to give away a copy of She Has Your Eyes to a lucky reader! YAY! Enter below for your chance to win! The rafflecopter widget will be open for the next eleven-ish days. Great non-review, Jennie, haha! I want to read them all! !